(This property is not being offered for sale. Classic Victorian Mansion Flat, completely restored and renovated. Two large reception rooms, four large bedrooms (highly adaptable to other uses), two bathrooms plus cloakroom, large eat-in kitchen with pantry and Aga cooker, laundry room, very large entry hall. Six working fireplaces. 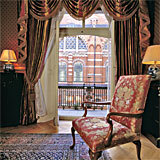 Balconies from reception rooms, overlooking Westminster Cathedral. Approximately 2,180 square feet gross internal area.